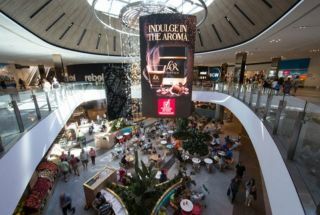 Pacific Fair Shopping Centre now features the largest curved LED displays in Australia with multiple NanoLumens LED video displays suspended over the mall’s two key areas. Pacific Fair was originally built in 1977 and has undergone numerous expansions, the most recent of which was an A$670 million renovation in 2014. The mall now features 420 shops, restaurants and entertainment destinations covering over 1.6 million square feet. NanoLumens LED video displays are suspended over Pacific Fair's two main areasThe NanoLumens NanoCurve LED video displays float over the Oculus and Myer department stores. The displays over Oculus are three single-sided 5MM NanoCurve displays each measuring 9.7 feet wide by 17.2 feet tall and the 6MM double-sided NanoCurve near the Myer store measures 17.6 feet high by 10.4 feet wide and is built with a wave shape running through the display. The NanoLumens solutions were recommended by Digital Place Solutions and installed by AV systems integrator Digi Corporate. The design criteria required the displays to be very thin and light. The atrium space is open with a lightly supported glass roof structure so the displays had to continue this design theme. This is the first time LED displays of this size have been deployed together in Australia, all operating together with common content creating a single advertising pallet for audience engagement.